Cindy I-Fen Cheng (Editor). The Routledge Handbook of Asian American Studies. Routledge, 2016. 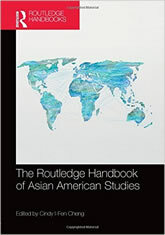 The Routledge Handbook of Asian American Studies brings together leading scholars and scholarship to capture the state of the field of Asian American Studies, as a generation of researchers have expanded the field with new paradigms and methodological tools. Exploring people, practice, politics, and places, this cutting-edge volume brings together the best themes current in Asian American Studies today, and is a vital reference for all researchers in the field.